At the moment I seem to be loving tracking down some really gorgeous fashion bargains online! Don't you find that when you don't have much spare money you seem to love EVERYTHING you see?! 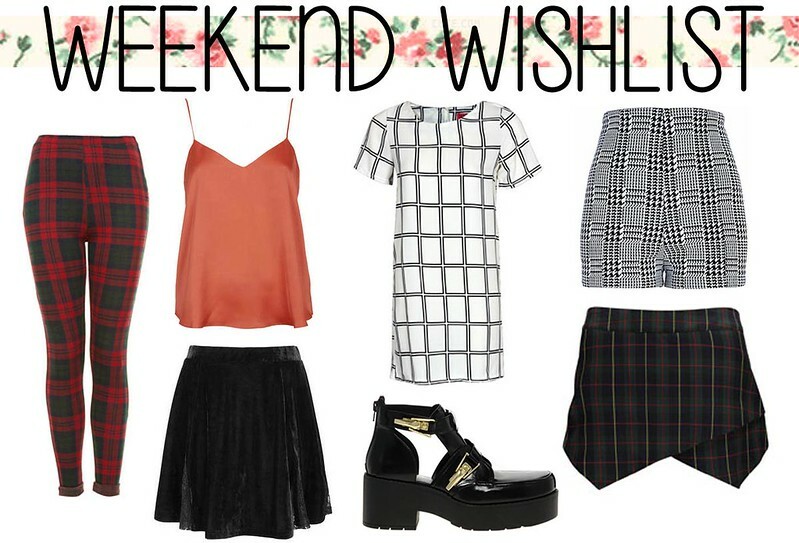 I've put together a little weekend wishlist of some of my fashion favourites online at the moment from various websites! Tartan Skort - £18 I fell a little bit in love with these treggings! I saw them recently in an Outfit store and they were styled with this jumper and these boots. I thought it was a perfect outfit and teamed with a jacket like this one! I still love a cami top and this orange coloured one is gorgeous! I've noticed there's a lot of velvet around now possibly because it's winter and that Topshop have some amazing velvet items in! I definitely think a velvet skirt is perfect for any wardrobe this season. If there's anything I'm loving this season and that's tartan. How amazing is this shift dress?! It's perfect for a day at the office, for a day look with a chunky pair of cut-out boots and thick tights and teamed with an oversized jacket. I was obsessed with dogtooth print this time last year and I'm glad the trend is slowly creeping back in. I love how gorgeous and cheap these shorts are from River Island! I think it's great how the skort trend has carried on this season as skorts are SO SO comfy. This checkered one is just to die for! I'm wearing those tartan treggings right now! They are so comfy and go with EVERYTHING so i definitely approve of your choice haha! That shift dress is gorgeous too - good picks! Maybe 'No Spend November' won't last as long as i had hoped... haha! I really want a skort and this one is so cute. Loving the Boohoo checked shift dress.